Green Beans and Roasted Butternut Squash Topped With Roasted Chestnuts And Citrus Poppy Seed Dressing - Celebrating Christmas "freshncrunchy way"
Our extended family had Christmas dinner this Saturday at my sister-in-law’s home which was a little early this year. There were 5 families with some guests and as expected in Filipino tradition, tons of food to partake of. Each family brought their own specialties and as usual, we had an awesome buffet! What’s been really encouraging lately is the openness of relatives to a better way of eating. And this inspires me even more to continue on my passion. So let’s just say that there were many vegetable and healthy grain dishes… and surprisingly, my brother-in-law excitedly volunteered to roast an organic turkey! So what’s a plant-based eating gal bring to a a family get together? Well, I made black rice, roasted some root vegetables and the usual, salads - ”freshncruncy way.” I did the black kale salad recipe posted earlier on this blog and because it’s Christmas, I thought why not another salad that would introduce CHESTNUTS! 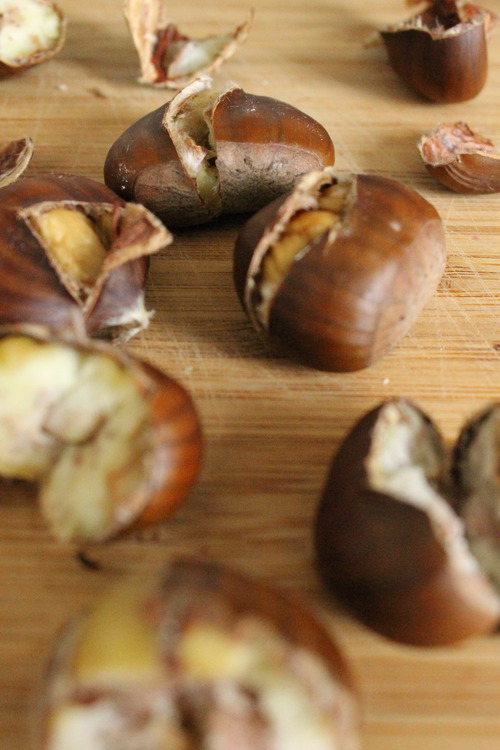 Yes, I finally roasted some chestnuts! I’ve never really done this before. Angel’s dad used to roast chestnuts several years ago but I didn’t really pay much attention at that time. It’s not really that complicated. I thought they would explode on me. Anyway, I cooked them in the toaster oven for 15 minutes and then added them to this salad. 1.Preheat the oven to 425F. Place the squash in a roasting pan then coat them with the oil and and add the garlic. Roast for 20-25 minutes. 2. Roast the chestnuts by following the instructions above. They have to be peeled immediately otherwise, it becomes a challenge. Chop them roughly. 3. 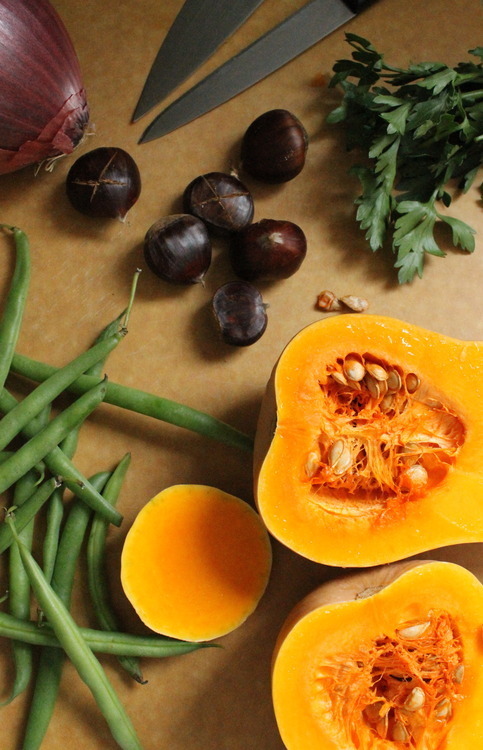 While squash and chestnuts are roasting, remove the ends of the green beans and wash them. Boil about 6 cups of water and blanch the green beans for about 2 minutes and drain through a sieve. Set aside. 5. Toast the poppy seed in a skillet for about 1 -2 minutes then whisk together all the ingredients of the dressing with the red onions to soften. 4. When squash is cooked, discard the garlic. 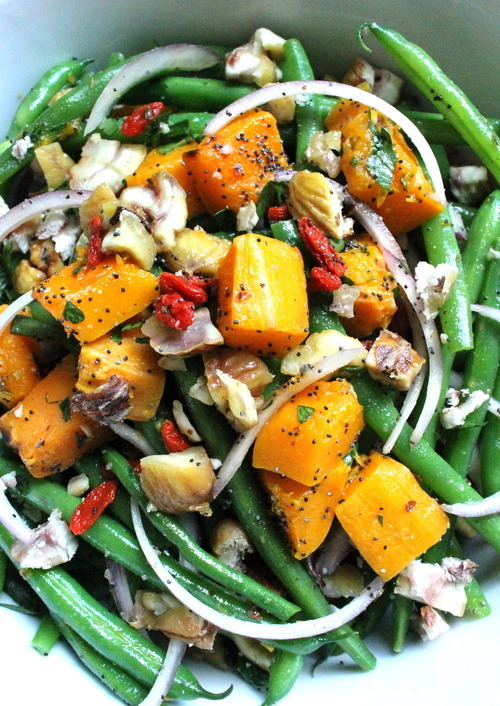 In a big salad bow, mix the squash and green beans and toss with the dressing. Top with goji berry, chestnuts and parsley. Enjoy! Note: Green beans and kale have been recently added to thelist of produce with high pesticide residues so it’s important to buy these organic. 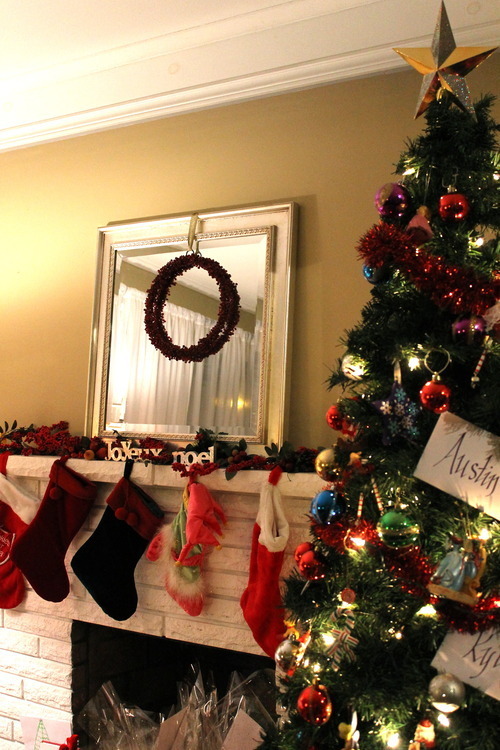 I hope you and your family will have some fun and make good memories this Christmas. I know that this season can sometimes become too commercial with what’s going on around us but we have to remember that in the midst of our busy lives and the gift buying frenzy, there is a bigger reason why we celebrate the occasion. This hit a note on me as I was listening to a message shared at church today - ”What are we giving to God as a gift?” It could be making peace with a relative or a friend, letting go of old time grudges or improving our relationship with our spouse; as for me, it’s to spend more time with the Lord with my bible studies. I’ve been pursuing so many things all at the same time that this part of my life has been somewhat neglected. May we all take the time to consider one thing to give as a gift to God. Merry Christmas! And yes the Liwag family enjoyed our time last night with lots of food and good conversations. The kids received gifts which gave them lots of joy. I saw all my highly technical relatives and got some good tips in photography…hopefully I will remember them all! This was taken at my sister-in-law’s home. I tend to be drawn to vegetables and fruits with explosive colours. Red, orange, purple, bright green and yellow. If we look deeper, colours actually represent nutrients and antioxidants. For instance the different berries, purple cabbage and pomegranates. One of those colourful vegetables is beets. Yes, beets! I know, I know…we don’t normally get inspired with beets especially with how they are usually presented out there but trust me, this one is yummy and refreshing. Just ask my husband as I’m usually ask to update his list of favourite meals. This can also be enjoyed in the holidays since it has that festive look. 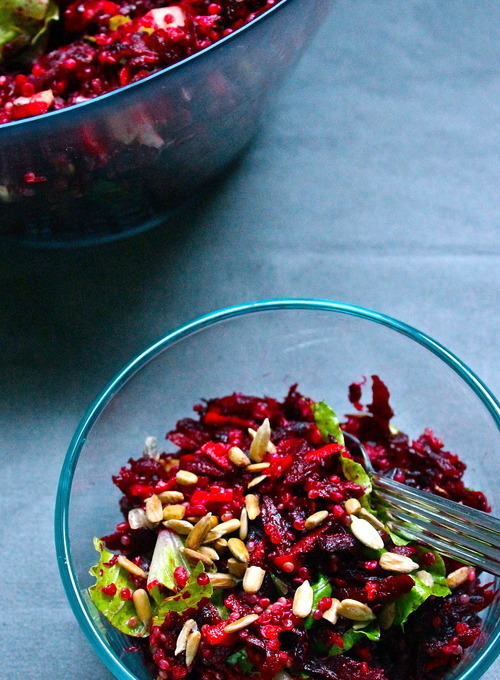 Instead of mixing the greens with the beets, you can also use them as a bed for the red salad when serving. What’s with beetsyou may ask. Well, they are rich in folate, fiber, vitamin C, manganese and potassium. They are also a tonic for the liver and a blood purifier. The red pigment in beets is called Betanin which is a phytonutrient that provides antioxidant, anti-inflammatory and detoxification support. 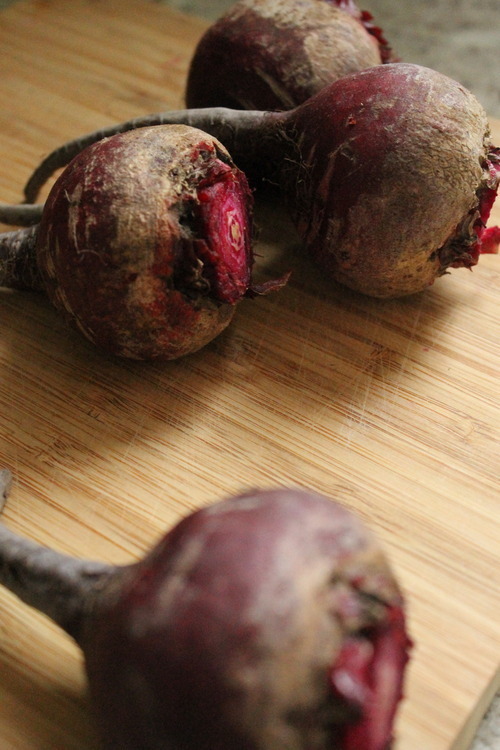 However, there is also a small percentage of people that cannot eat beets…read here. But for most of us who can eat them, here is a recipe that we can all enjoy. Pour 2 cups of water into a small pot and bring to a boil. Wash the quinoa in a wire sieve then stir into the boiling water. Reduce the heat and simmer for about 15-20 minutes until all the water is absorbed and the quinoa turns transparent. When cooked, transfer to a bowl to cool. While the quinoa is cooking, wash the vegetables. Shred the Romaine hearts and grate the beets and carrots. Use a pair of gloves if grating to prevent your hands form turning red. Better yet, if you happen to have a food processor with those nifty attachments, use it and will even do the job faster for you. 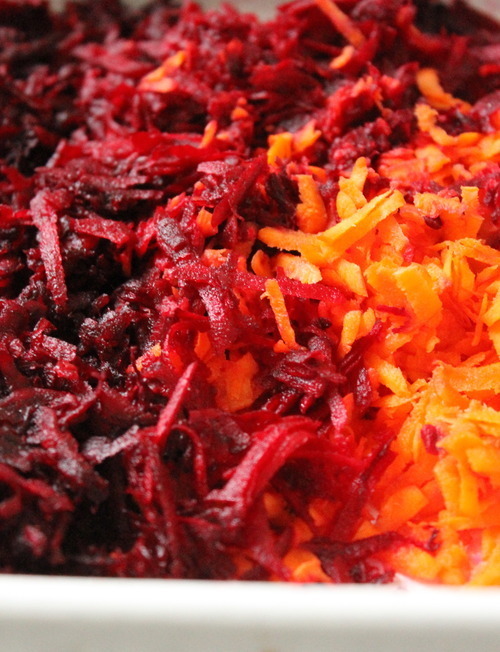 Place the grated beets and carrots with the lettuce in a salad or mixing bowl. Lightly toast the sunflower seeds in a skillet or toaster oven. 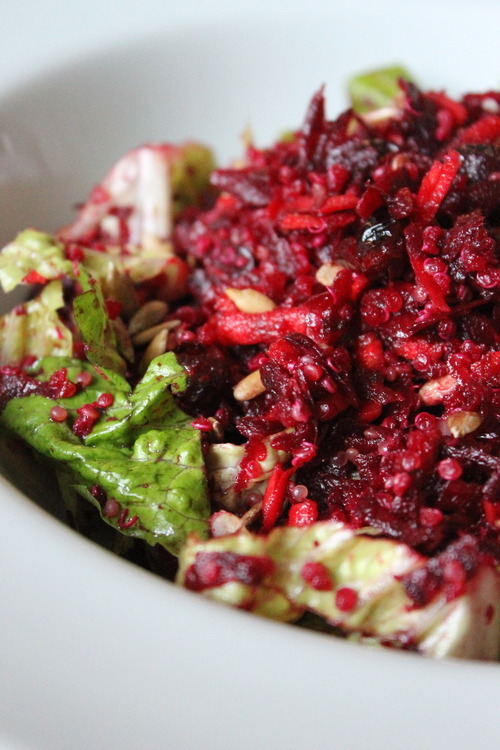 Mix the cooled quinoa with the beets, carrots, Romaine hearts, cranberries and half of the sunflower seeds. In a small jar, place the ingredients for the dressing and with the lid secure, shake well to incorporate. Pour the dressing into the beet mixture and toss well. Top it with the rest of the sunflower seeds. Enjoy! My 15-year old son’s opinion is huge when it comes to planning and making our meals. And it gets exciting when the big sporting events come up. He actually has “the say” about the menu for that particular party and also invites friends and relatives to come and celebrate the occasion. When he was much younger, we used to even dress up for Oscar night to enjoy a special meal and grandma was usually his special guest. Well, he’s grown a bit now and has moved on from the Oscar celebrations (how I miss those times). Last weekend was the Grey Cup and although the excitement can never match that of the Superbowl, we still made some special food and Austin gave mom one day’s notice for the menu: vegan black bean and corn chili, guacamole, baked falafel and tabouli salad. Most friends were away and it was too late to invite relatives so the three of us enjoyed our little Grey Cup party and we had some leftovers which we could really use for a day or two. 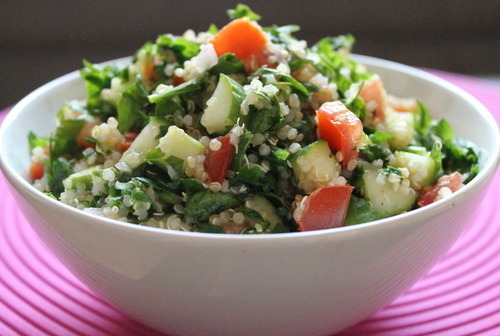 I have decided to post our Quinoa Tabouli Salad and will share our chili recipe at a later time. This dish is on our top 20’s list of favourite foods. It is so nutritious and refreshing! I made a party size one but you can always make half of the recipe if you find this too big for you. It can be stored in the fridge as a lunch option for the next few days. Add some chickpeas or beans to the leftovers for a great variation. 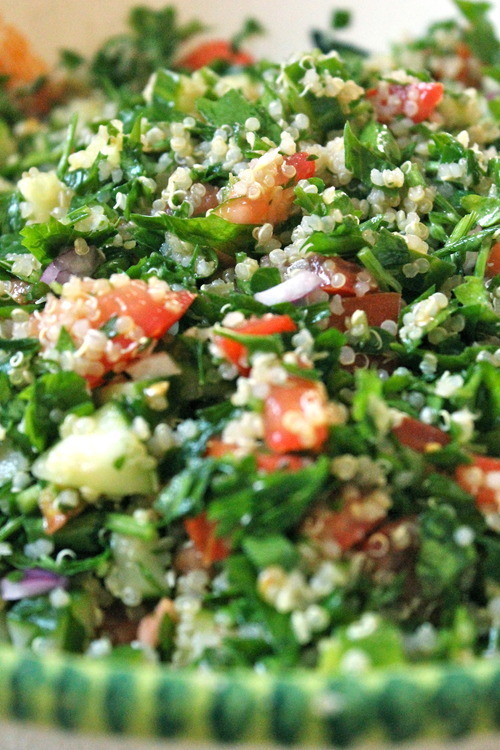 Tabouli or tabouleh salad is a Middle Eastern dish traditionally made with bulghur or cracked wheat grains, parsley and other vegetables. It can also be substituted with quinoa which, to me, is a better grain as it is considered a complete protein source. Parsley, usually seen and used as a garnish is actually a powerhouse of nutrients. It’s a good source of folic acid, iron, Vitamins A, C and K. What’s really great is that they are an inexpensive but nutritious additions to our meals and even when juicing vegetables and fruits. 1. Pour 2 cups of water into a small pot and bring to a boil. Wash the quinoa in a wire sieve then stir into the boiling water. Reduce the heat and simmer for about 15-20 minutes until all the water is absorbed and the quinoa turns transparent. When cooked, transfer to a bowl to cool. 2. While the quinoa is cooking, remove the hard stems of the parsley and wash very well. Dry the leaves in a salad spinner then chop them finely. Set aside in a mixing or salad bowl. 3. Wash and prepare the rest of the vegetables including the mint leaves and cut them accordingly. Combine them with the parsley. 4. In a small jar, place the ingredients for the dressing and with the lid secure, shake well to incorporate. 5. Add the cooled quinoa to the vegetables then toss with the dressing. Adjust the taste. It’s a good idea to prepare it at least 30 minutes to 1 hour before serving for a more tasty salad. Enjoy! Persimmon and pomegranates are two of my fascinations this fall. I’ve been eating them everyday…adding them in my fruit bowl, chia porridge and salads. I am so in love with both their colours…deep orange and ruby red. One sweet while the other tangy and when mixed with greens and avocado —it makes for perfect salad! Persimmon has two popular varieties: the heart-shaped Hachiya which can only be eaten when soft and fully ripe; otherwise, it will be astringent or unpalatable. The other variety is Fuyu which looks squat, a bit like a tomato and can be eaten while still firm (slightly unripe). It can also be enjoyed when it’s ripe. I normally buy Fuyu as it is more available in the market although I also enjoy the very ripe Hachiya which is great in smoothies and puddings. 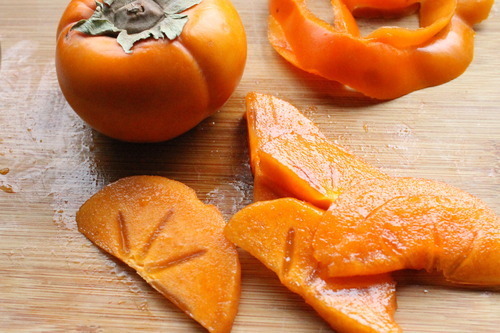 I am looking forward to making other recipes using persimmon in the coming days. And who has not heard about pomegranates? Here is a description of this awesome fruit from this link. 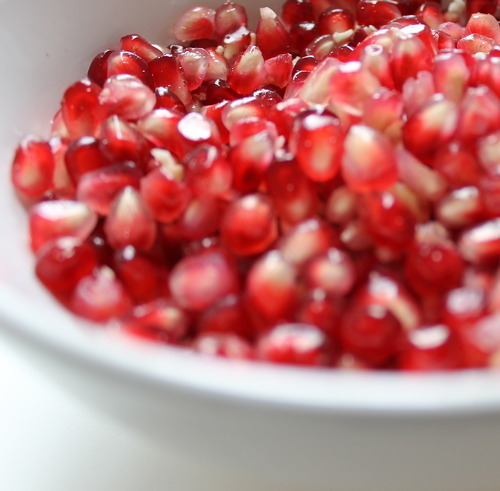 To remove the seeds of the pomegranate, cut it in half then get a bowl and fill it with water. Submerge them into the water then pry out the seeds from the rind with your fingers. Remove the white pith as much as you can. The seeds will sink to the bottom of the bowl while the white pith will float. Remove the hard stem of the kale, wash them well and slice them into thin strips then spin dry and set aside in a mixing bowl. Combine the ingredients for the dressing in a blender and blend until smooth. “Massage” the dressing into the kale until it gets soft and nicely coated. Let it sit for 15 minutes in order for the dressing to be absorbed. 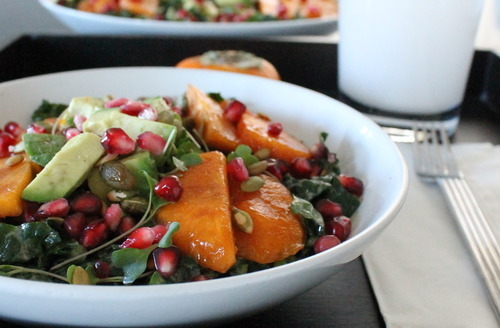 Transfer in a serving or salad bowl and add the persimmon, avocado, sprouts and sprinkle the pomegranate seeds and pumpkin seeds. Enjoy! This dish is my version of comfort food especially in the cooler days of fall. It’s also one of our packed lunch options for work. It has that perfect mix of protein, complex carbs, the crunchiness of the snap peas and some tartness from the tomatoes and the dressing. It definitely helps fuel us on our busy work days. I think quinoa no longer needs much of an introduction these days. It seems like it has already been adapted by a lot of people into their day to day meals. As I went through my journey of finding the right foods to eat because of my digestion issues, this is one of the healthy whole grains (or pseudo grain like how others call it) that I can handle without any reactions. And so for the last 2 years, I have experimented with so many different ways of preparing it and this is one of my favourites. Cooking quinoa: 1 cup of dry quinoa will yield approximately 3 cups cooked quinoa. Rinse the quinoa well under cold water by using a wire sieve and drain. Put the rinsed quinoa into a saucepan and add cold water. The quinoa to water ratio is one part quinoa to 2 parts water. Cover and bring to a boil. As soon as it starts to boil, turn the heat down to a simmer, and open the lid to prevent boiling over. Simmer for 15-20 minutes and the lid can be put back once the water has been absorbed. 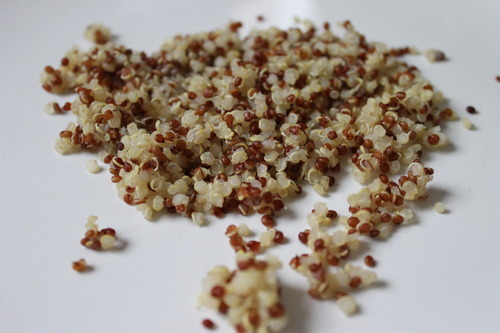 The quinoa becomes a little transparent when it’s cooked, except for a little spiral sprout. 1. Wash and cook the quinoa by following the steps above. 2. 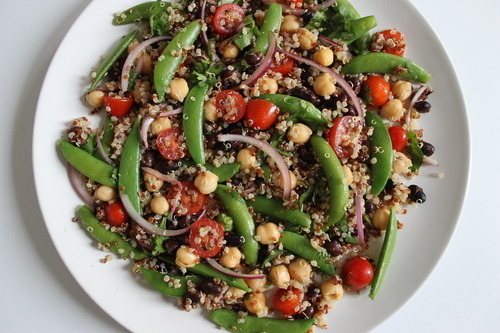 While the quinoa is cooking, wash the the snap peas and trim the hard ends. 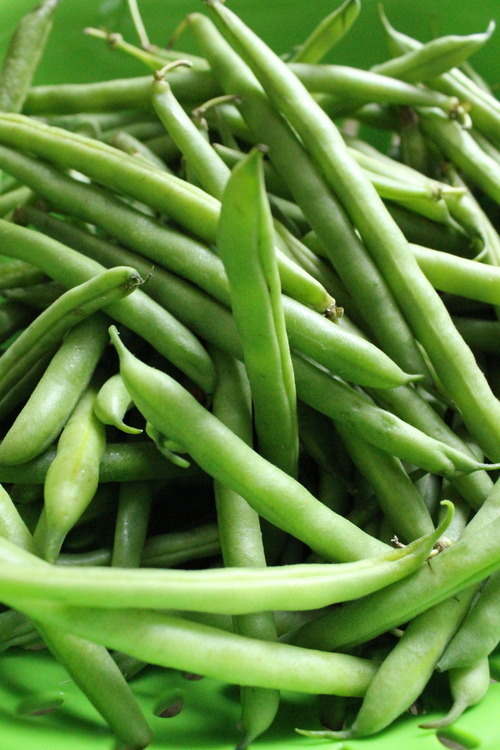 Boil water in a pot and blanch the snap peas for 1 minute and drain through a wire sieve. Make sure not to leave it too long as they will end up mushy. Set aside to cool. 3. 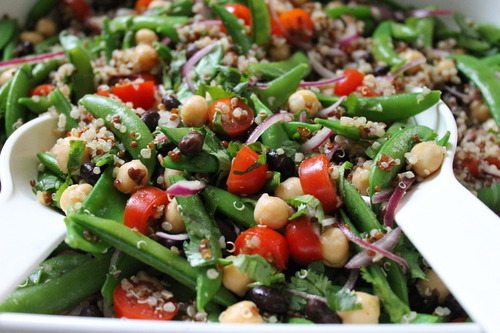 In a salad or mixing bowl, mix the quinoa, chickpeas and black beans. Add the cooled snap peas. 4. Combine the dressing ingredients in a small bowl including the red onions and half of the coriander leaves and stir to incorporate. Leave for about 2 minutes just to soften the red onions. 5. Pour the salad dressing into the quinoa mixture and toss. Adjust the taste if necessary but the amount of the dressing is just perfect for the whole dish. Garnish with the rest of the coriander leaves. Enjoy! Note: The snap peas can change colour if the dressing is left too long so it’s a good idea to add them just a few minutes before serving the salad. This may sound cheesy and I’m sure our good friend Marvin who is an art director can come up with a better line than that but you know what I’m getting at. I’m not sure what your experiences or memories are about this vegetable. If they’re not positive, I hope you can be open and try one more time. 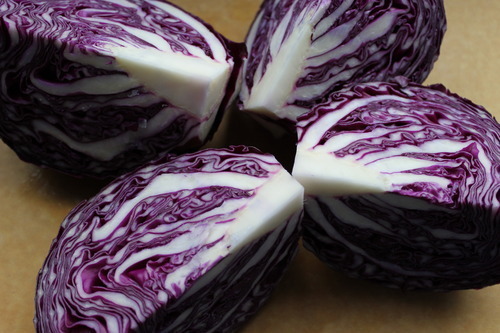 And so here’s my take on cabbage salad… trying to promote our cruciferous, vitamin packed, cancer fighting, antioxidant giver friend and hopefully get more fans. juice of 1 lime, approximately 1/4 c.
1. In a skillet or toaster oven, lightly roast the sesame seeds for about 2 minutes making sure to watch closely as they can burn quickly. 2. 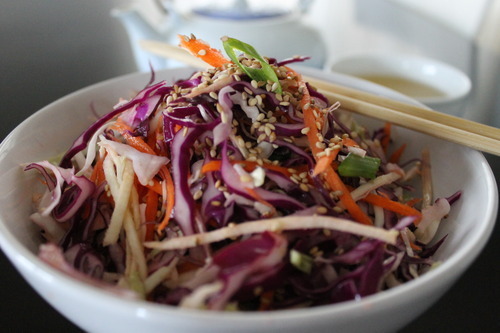 In a big salad or mixing bowl, combine all the salad ingredients except the green onions, apples and sesame seeds. 3. Place the ingredients for the dressing in small jar and with the lid tight, shake well to incorporate. 4. Pour the dressing into the cabbage mixture and toss well. Adjust the taste. 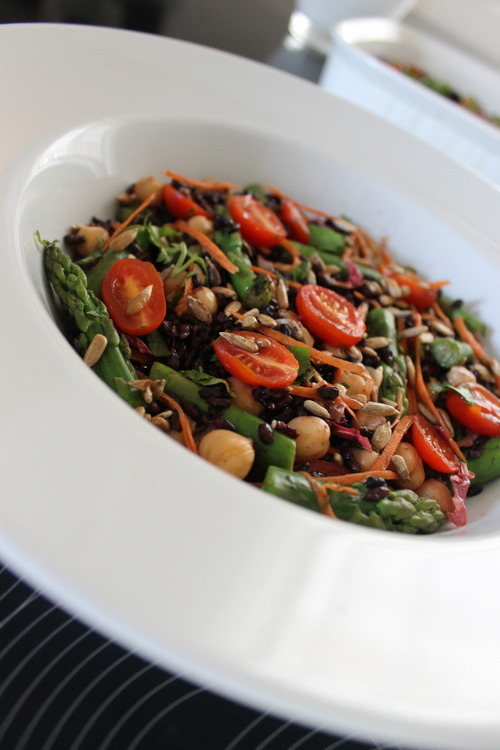 It’s a good idea to let the salad sit for 15 minutes in order for the dressing to be absorbed. 5. Just before serving, garnish with green onions, add the apples and sprinkle the toasted sesame seeds. Enjoy! Suggestions: For a variation, the tahini dressing which was posted earlier can also be used if you desire a creamy dressing. For another twist, omit the apples and add wakame seaweed using the lime dressing. Introducing salads to family members can be challenging sometimes. It certainly wasn’t easy for me in the beginning. What helped open the door for my 15-year old son when he was much younger was mixing some fruits with greens. I think it’s a great way of having a serving of both in a dish and a not too radical way of presenting greens to those who are not too fond of them. Personally, I just enjoy the combination of sweet, tangy, creamy, crunchy and sometimes bitter flavours in a fresh serving of salad! Figs are best eaten one or two days after buying them as they are one of the most perishable fruits. They should be fresh, plump and tender, not bruised or mushy. Before eating figs, their stems must be removed, washed and wiped dry. I just think that the soft and sweet qualities of fig complement the peppery flavour of arugula. 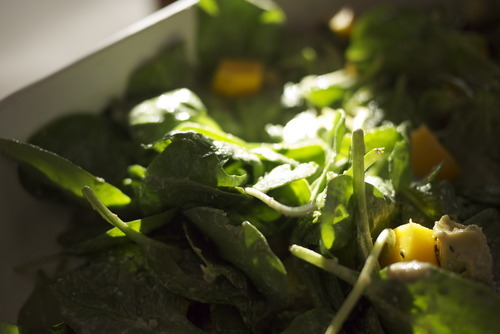 Arugula also known as rocket belongs to the brassica family and is closely related to watercress, mustard greens, radishes, kale and cauliflower. The younger leaves are better and not as bitter or as peppery as the more mature ones. They are rich in Vitamins A, C, K and B Vitamins. 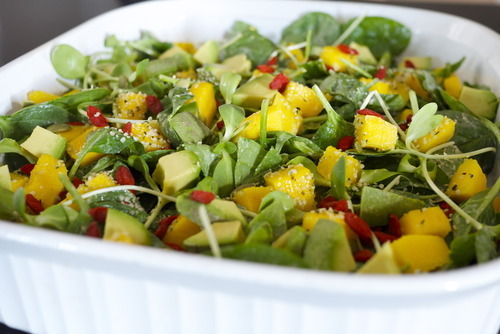 This salad is so simple yet refreshing and delicious! This has been added to the list of our family’s favourites. Feel free to mix and match fruits and greens. Pears, pomegranates and apples are good options at this time and berries, mangoes or pineapples are great in the summer time. We are also using hemp hearts which are shelled hemp seeds. These are excellent source of protein (10g. per 3 Tbsp), Omega 3 and Omega 6, Manganese, Zinc, Iron, Magnesium and some B Vitamins. Wash and spin dry the arugula. Put them in a mixing bowl. 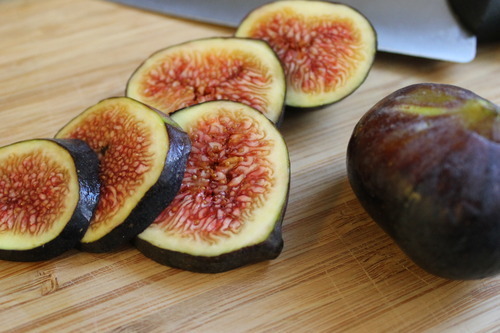 Cut the figs into 4-5 slices depending on their size and set aside. Place the dressing in a bottle and shake well to emulsify. Pour half of the dressing into the greens and also add half of the hemp seeds and toss. Adjust the taste and add more dressing if necessary. 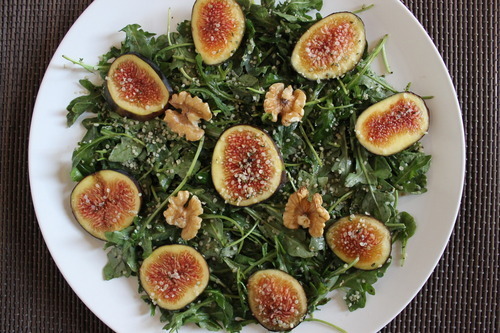 Serve the salad and top with slices of figs, walnuts and sprinkle the rest of the hemp seeds. Note: I don’t follow the usual oil and vinegar ratio of 3 parts oil to 1 part vinegar in my measurements as I prefer a tart dressing and therefore less oil. Please feel free to add more oil if you prefer. I first tasted black rice when I went home to the Philippines last year and visited my brother Bobby and his wife Joyce. As a couple with 2 young children, they are also pursuing a healthy way of eating and have replaced white rice with this exciting variety. Black rice is widely grown in Asia. It used to be called “forbidden rice” in China centuries ago and was believed that only nobles were allowed to eat it. This type of rice is unpolished, the outer husk being intact and is rich in antioxidant called anthocyanin. Anthocyanin is responsible for the red, purple and blue colours present in vegetables, grains and fruits like blueberries or blackberries. Health experts say it’s a cancer fighter and helps prevent heart disease and improves memory. 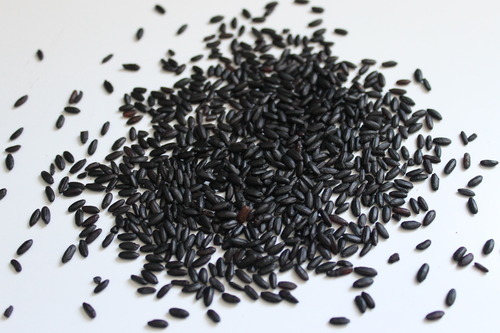 When black rice is cooked, its colour turns into deep purple and has a delicious, chewy and nutty taste. It’s a great source of fiber, niacin, thiamin, magnesium and iron among other things. Cooking takes longer than regular rice and soaking it for several hours or even overnight is recommended for better digestibility. However, if you are pressed with time, it can be cooked right away after rinsing it a few times. Use 2 cups of water for every cup of black rice and it cooks for about 45 minutes Soaked rice would cook up to 30 mins. One cup of black rice will yield just short of 4 cups. 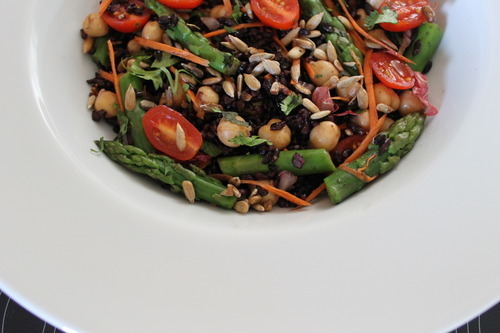 In this dish, it is being paired with chickpeas. Chickpeas are ever present in my pantry. They are so versatile….you can add them in salads and can make soups, stews, dips and even salad dressings out of them. A cup of these goodies contain 15 g of protein! Remove the hard ends of the asparagus, wash and cut them into 1 1/2 “ long. Boil water and blanch them for 2 minutes and drain through a wire sieve. Set aside. Place all the ingredients of the dressing into a jar and with the lid secure, shake well to incorporate. Toast the sunflower seeds in either the toaster oven or skillet making sure to watch closely as it can easily get overdone. In a big salad or mixing bowl, put all the salad ingredients except for 1/2 of the coriander leaves and the sunflower seeds. Pour about 1/2 of the salad dressing and toss the mixture making sure that the dressing is well incorporated. Adjust the taste and add more dressing if needed. Garnish with the rest of the coriander and top with sunflower seed. Enjoy! It was rice planting season in my hometown when I went home to visit last year and it it brought me back to many childhood memories. These rice fields were just behind our home and these folks are either relatives or neighbours doing the hard work very early in the morning. 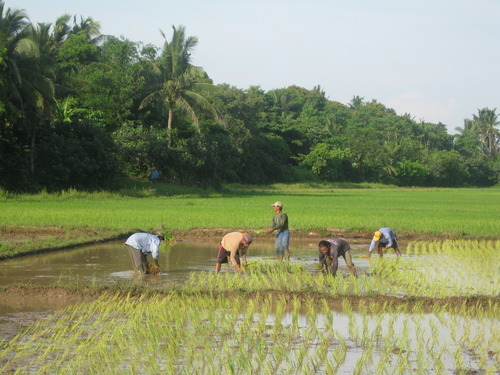 The variety being planted here is usually known in the North American grocery store as white jasmine rice or white milagrosa rice. 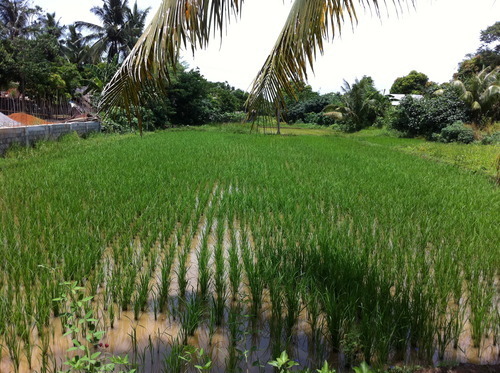 As a little child growing up in this agricultural corner of the world, little did I know that there would be so many varieties of rice out there. Black rice - who knew? 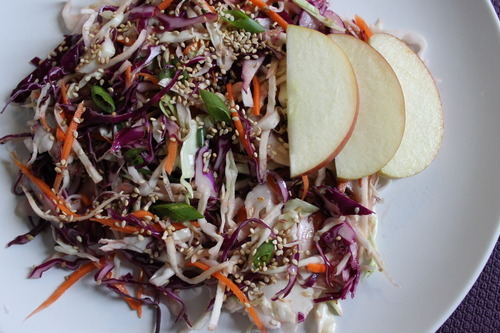 This is one of those kid-friendly and crowd pleaser kind of a salad. I make it for dinner parties, bring it to office potlucks and extended family get togethers. It has actually become my most requested salad these days. I think it has that distinct appeal…just look at the vibrant colours! People actually eat it and it just doesn’t end up sitting in a lonely corner at a huge potluck table! I grew up in a culture where raw salads were not popular and this certainly is an easy INTRO to eating greens. It’s usually a summer item but I think it can still be eaten in the fall and can be paired with a warm broccoli or cauliflower soup. Mango can also be replaced by Fuji apple, nectarine or pear. Of course if you live in a warmer part of the globe like the Philippines, you can eat it all year round. 1 pack organic baby spinach about 11 oz. 1. Toast the pumpkin seeds for 2-3 mins. in a toaster oven or on the stove making sure to watch closely as it can easily get overdone. 2. Wash the greens, spin dry and put them in a mixing bowl with the sprouts. 3.Place all the ingredients of the dressing in a small bottle and with the lid on and tightly closed, shake well to incorporate. 4. Just before serving, add the dressing into the greens and toss. Adjust the taste and transfer to serving bowl. 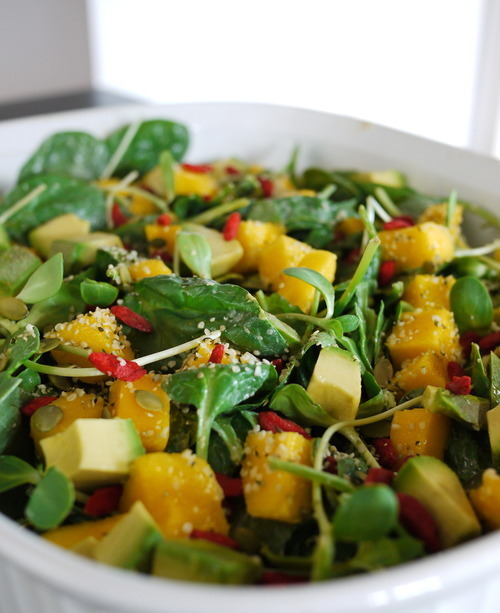 Top it with the mangoes, avocado, goji berry, hemp hearts and pumpkin seeds. Enjoy! Note: You can also use the Creamy Sesame Dressing which was posted earlier if you desire a creamy dressing. Fall is such a beautiful season. 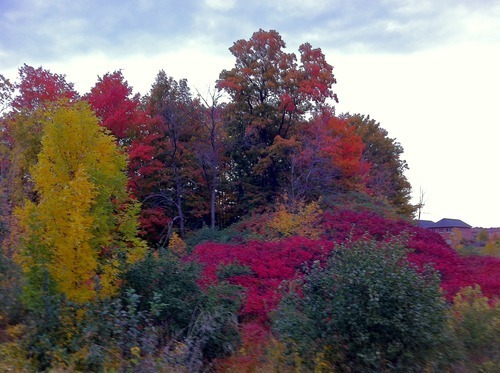 The colours around us are so vibrant! There is a little forest beside my home that displays the richness and wonders of God’s watercolours and it is so awesome that I get to enjoy them everyday. 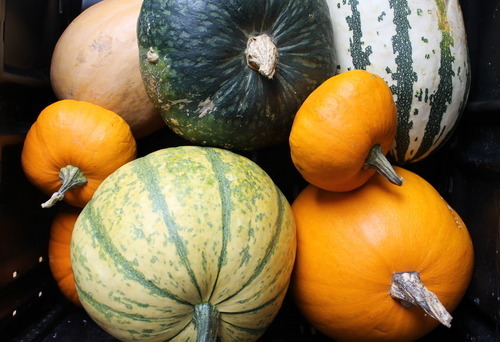 With the changing of season, we are also seeing fall vegetables like squash. I have a few varieties from my last CSA (Community Supported Agriculture) delivery so I just made this dish for the family recently. 1.Preheat the oven to 425F. Place the squash in a roasting pan then coat them with the oil and black pepper and add the garlic. Roast for 20-25 mins. 2. 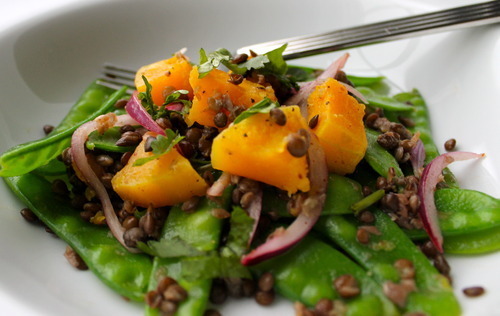 While squash is roasting, remove the ends of the snow peas and wash them. Boil about 6 cups of water and blanch the snow peas for 1 minute and drain through a sieve. Set aside. 3. Whisk together all the ingredients of the dressing then add the red onions to soften. 4. When squash is cooked, discard the garlic. 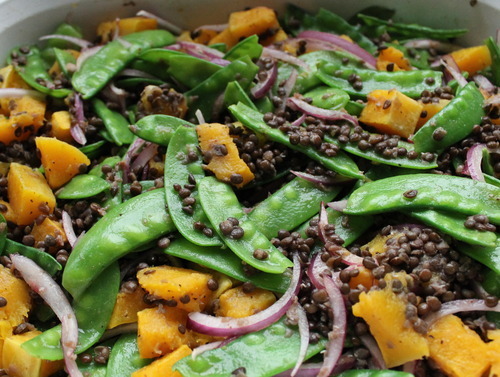 In a big salad bow, mix the squash,lentils and snow peas and toss with the dressing. 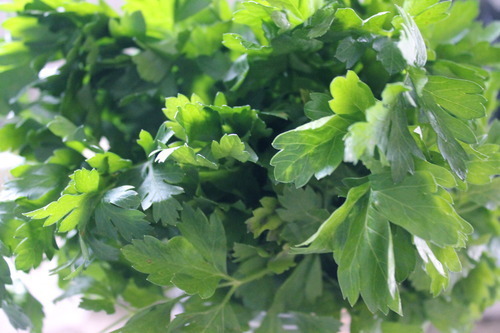 Garnish with coriander leaves and serve immediately. 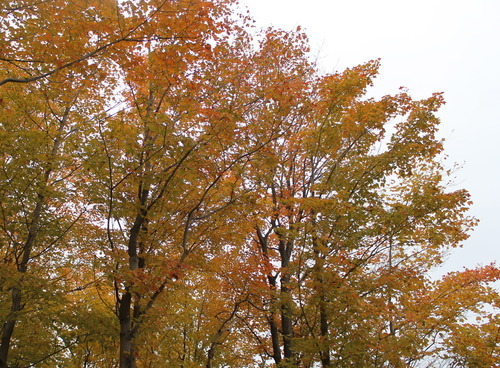 Fall is such a lovely time of the year! What a way to start a food blog with one of our family’s favourite salads. Yes, even my 15-year old love salads! But this didn’t happen overnight. You see, my boy grew up not watching cartoons but the sports networks and The Food Channel. So you can just imagine cooking for your child whose idea of a delicious meal being the celebrity chef’s creations! But like they say patience and perseverance always pay off. One meal at a time and my foodie is finally on my side. He’s my greatest fan and hardline critic rolled into one. I love it! My kitchen is always busy as he doesn’t just have the appetite but also his own ideas about great flavours or what is exciting and yummy - which makes food preparation even more interesting for me. So kale has been getting a lot of attention lately which is deserving for the king of greens. It could very well be the new beef! It’s packed with nutrients and is high in iron, Vitamins A, K, calcium and protein among other things. 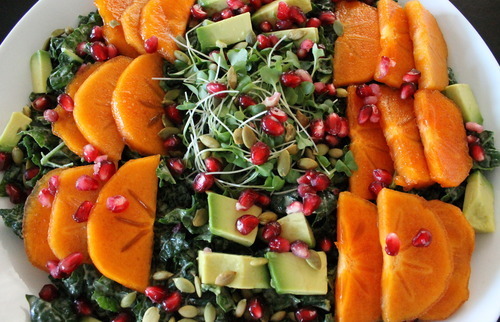 Sunflower sprouts or micro greens are also powerhouses of nutrition. They are little plants just breaking out from the seeds and are loaded with enzymes, Vitamins A, D, E and B complex and 3.5 oz. 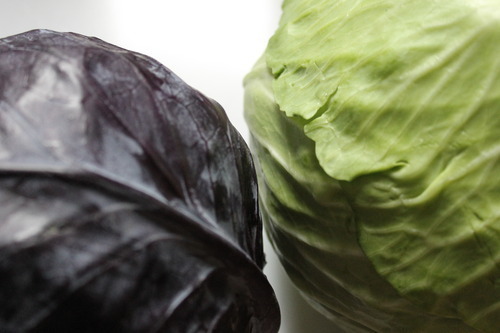 of these sprouts boasts 25 g. of proteins! 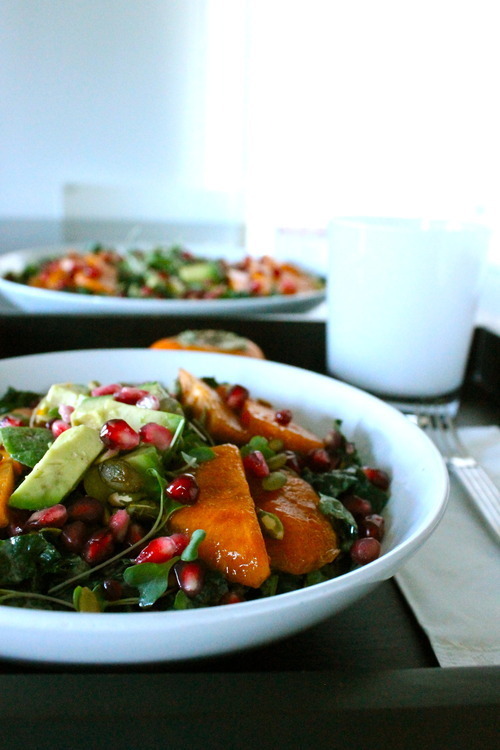 Adding carrots and pomegranates to this salad just make it a nutritious mix for our plates! 1. To remove the seeds of the pomegranate, cut it in half then get a bowl and fill it with water. Submerge them into the water then pry out the seeds from the rind with your fingers. Remove the white pith as much as you can. The seeds will sink to the bottom of the bowl while the white pith will float. 2. Place all the ingredients for the dressing into a blender, a magic bullet or Nutribullet and blend until smooth. Add a little more water if you find it too thick. With your hands, “massage” the dressing into your kale ‘til it gets soft and nicely coated. 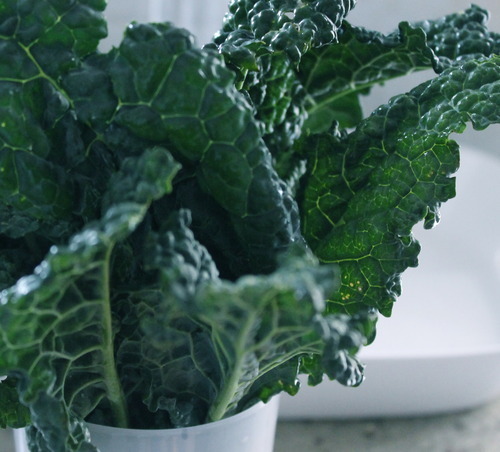 Taste the kale and adjust accordingly… it may need more sweetness, tanginess or salt. Let it sit for 15 mins. in order for the dressing to be absorbed. 3. Just before serving, add the carrots, sprouts, pomegranate seeds and sprinkle the hemp hearts. When serving the salad to guests, put the toppings on each plate…it’s great for them to see and enjoy the vibrant colours of the dish!